The mission of the SHGs is to aid the less privileged and low income households in the Chinese, Eurasian, Muslim and Indian communities in Singapore. Employees are required to contribute monthly to the fund representative of the community they are a part of. An employee may opt-out or contribute a different amount by completing the relevant forms with the respective SHG. As an example, if an employee is Chinese-Muslim (race in NRIC is Chinese), he/she will need to contribute to both Chinese Development Assistance Council Fund (CDAC) and Mosque Building and Mendaki Fund (MBMF) but he/she can choose to contribute to one and opt-out the other. Who needs to contribute to these Self-Help Group (SHG) funds? Chinese Development Assistance Council Fund (CDAC) - All employees belonging to the Chinese community who are Singapore Citizens and Singapore Permanent Residents. Eurasian Community Fund (ECF) - All employees belonging to the Eurasian community who are Singapore Citizens and Singapore Permanent Residents. Mosque Building and Mendaki Fund (MBMF) - All working Muslims who are Singapore Citizens, Singapore Permanent Residents and foreign employees. Singapore Indian Development Association Fund (SINDA) - All employees belonging to the Indian Community who are Singapore Citizens, Singapore Permanent Residents and Employment Pass holders. 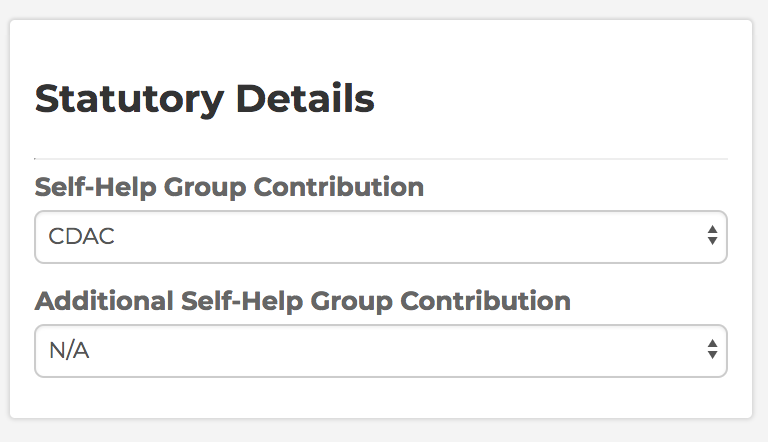 Where to include Self-Help Group Contribution for my employee?